Based at Women’s College Hospital with a cross appointment at Mt Sinai Hospital, Dr. Tim Dwyer’s surgical practice encompasses open and arthroscopic surgery of the knee, shoulder, hip and ankle. His knee surgery focus is on primary (hamstring and BPTB) and revision ACL reconstruction, the management of cartilage and meniscal lesions, disorders of the patellofemoral joint, as well as other ligament reconstruction about the knee. His shoulder practice encompasses all complex shoulder pathology, including shoulder instability and rotator cuff pathology, including the surgical treatment of massive rotator cuff tears. Dr. Dwyer performs hip arthroscopy for labral tears and CAM impingement, as well as ankle arthroscopy for OCD and chondral injuries of the talus. Dr. Tim Dwyer’s primary research focus is on the assessment of surgical competence, which is the basis of his PhD thesis at IMS. He designs and validates assessment methods, aimed to establish a minimal level of competence in both residents and fellows. This research occurs within the setting of Competency-Based Medical Education, a medical training model that was developed and established by the Division of Orthopaedic Surgery at the University of Toronto. Dr. Dwyer’s other main focus is assessing competence in the performance of technical procedures. Much of this work occurs outside of the operating room, at WCH’s state-of-the-art arthroscopic simulation laboratory. Dr Dwyer’s research develops novel surgical simulation models for both sports medicine and other subspecialties, allowing trainees to both acquire and demonstrate the ability to perform complex technical procedures, prior to performance in the operating room. Tim also performs research in sports medicine, especially in regards to knee and shoulder surgery. He is involved in clinical trials for massive rotator cuff defects, shoulder instability and ACL reconstruction, as well as shoulder and knee osteoarthritis. He also supervises basic science projects that focus on complex shoulder instability, and the reliability of measurement as it pertains to clinical practice. 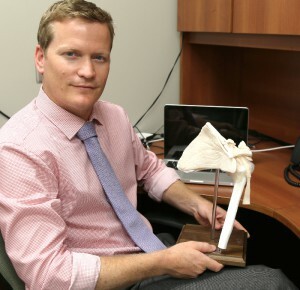 Dr. Tim Dwyer is the team orthopedic surgeon for the Toronto Football Club (TFC).